TAKAMATSU (Kyodo) Archaeologists in Kagawa Prefecture have found 22 stone heaps dating back to the second century B.C. that may help research on mounded burials predating Kofun period tumult, the Center for Archaeological Operations said Saturday. Officials from the prefectural-run center said the stone clusters, believed to be from the middle Yayoi period (circa 100 B.C. to A.D. 100), were found at the Narishige site in Shirotori, Kagawa Prefecture. Yayoi mound burials were discovered previously at the Hagiwara site in Naruto, Tokushima Prefecture, and at two other locations in Shikoku, but all three can be traced only to the late Yayoi period of the third century, making the Narishige find among Japan's oldest. Officials said that since some of the clusters resemble the keyhole-shaped tumuli for which the Kofun period (300-710) is named, the stone heaps may provide clues to the evolution of the burial tradition between the periods of Japanese prehistory. "This could be regarded as the root of Kofun period stone mounds, although size and structure are altogether different," said Hironobu Ishino, an archaeology professor at Tokushima Bunri University. Ishino said the heaps might not differ much in age from stone mounds and dolmens dating from the third century B.C. discovered in the northern part of the Korean Peninsula and northeastern China. According to the center, the size of the stone clusters range from 4 to 11 meters in diameter. In total, some 80,000 rocks and stones of various sizes — with the largest as big as a man's head — were piled up in circular mounds averaging 0.4 meters in height. The heaps were scattered within a 2-hectare area and slightly up to 1.5 meters underground. One rounded mound 9 meters in diameter had a square-shaped rock measuring 3.7 by 0.8 meters jutting out on top of it. Archaeologists, who have been working at the dig since February 1997, were able to date the find based on Yayoi-style pottery from the middle part of the period dug up from two heaps. They also excavated the remains of wooden coffins. No burial accessories were found in any of the heaps, but fragments of stone implements like knives were present, suggesting that leaders of an early agricultural settlement were buried at the site. Experts are now trying to determine the connection between the Narishige mounds and the Iwase Oyama tomb cluster from the early Kofun period found some 40 km away in Takamatsu. 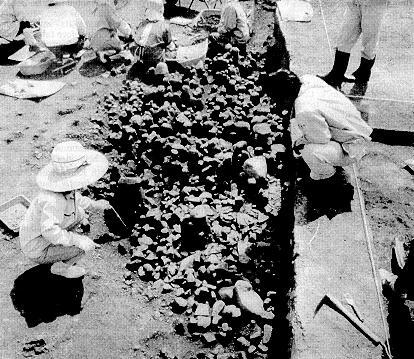 ARCHAEOLOGISTS EXAMINE a stone heap believed to be from the middle Yayoi period at the Narishige site in Shirotori, Kagawa Prefecture.